These root vegetable hash browns are much healthier than eating just regular potatoes. 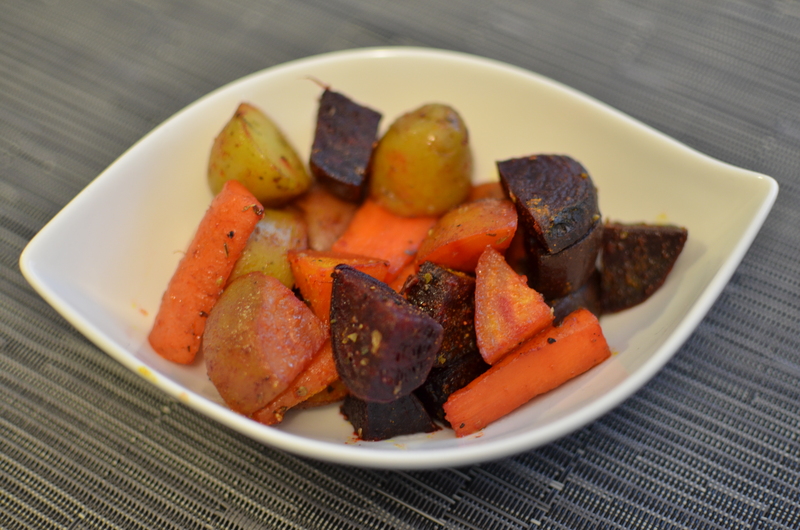 For this recipe I use beets, purple and red potatoes and carrots. These hash browns are full of flavour and much lighter than the regular ones. Plus you still get that satisfying feeling after you eat them. I serve these on the side of tofu omelettes and sometimes eat them alone as a snack. 1. Rinse and scrub the root vegetables with a brush. 2. Boil water in a kettle and transfer to a stock pot, this uses less energy. 3. Bring the water to a boil and add the beets. 4. Cook for the beets for about 10 – 15 minutes and then add the potatoes. 5. When a thin knife slides into the potatoes easily and when the potatoes are still firm add the carrots. 7. Heat a medium-sized saucepan on medium heat and add the olive oil. 8. Add the beets and cook for about 3 minutes. 9. Add the potatoes and drizzle with 1 tbsp of olive oil. Grab the handle of the pan and toss the vegetables, this will make the veggies crispy on the outside. 10. Add the carrots and another 1 tbsp of olive oil. Toss the vegetables. 11. When the vegetables are nearly roasted add the spices, toss and cook for another 3-5 minutes. You are currently reading Root Vegetable Hashbrowns at Coriander Kitchen.